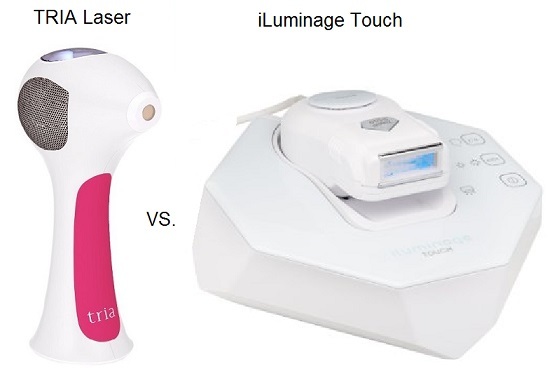 You would probably agree that iLuminage Touch and the TRIA are at the top tier of home hair removal devices. They have both been around for some time, and choosing one of them isn’t an easy task. In this post we will review their pros and cons, and compare them so you can make an educated purchasing choice. It would be fair to say, non of these two devices is perfect. 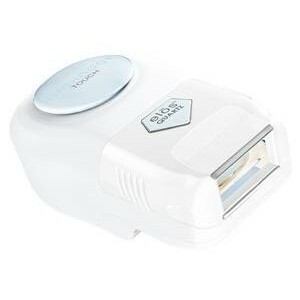 Each of them has upsides and downsides, and the best hair removal device is the one which fits your needs best. There isn’t a “perfect” device, nor a device which is “better than all the rest”, so you should concentrate to find which of these is best for your needs. It would be impossible to compare the TRIA and the iLuminage without understanding the differences between laser and ELOS. First lets understand about laser hair removal. In the base of the technology is the fact that dark surfaces absorb more light energy than white surfaces, and they heat up. The laser hair removal works by targeting the dark melanin in the hair with the high energy of light beam. The instant laser heats the dark hair so fast it evaporates. The TRIA laser uses a 810 nano-meter wavelength beam, in a diameter of a finger tip. The TRIA has 5 energy levels, it can emit energy from 7 Joules per cm² at the lowest setting to 22 Joules per cm² at the highest setting. Joules per cm² is the way to measure the amount of light energy pulsed at the skin. TRIA has the highest Joules per cm² compared to all other home hair removal devices! 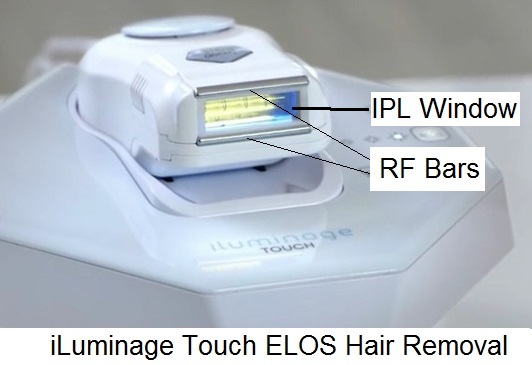 The iLuminage is using ELOS technology which is a combination of IPL (Intense Pulsed Light) and RF (Radio Frequency). What is IPL – The idea of the IPL is similar to laser, except that the IPL is not a focused beam, but a wide flash of bright light. The flash of light targets the dark pigment in the hair and heats it just like laser. The iLuminage Touch has maximum IPL – optical energy of 4 Joules per cm². What is RF – The iLumiage has two RF bars at the side of the IPL window, these bars transmit a radio wave, which heats the heated hair. The RF is transmitted from one bar to the other when the bars are touching the skin. The bars conduct 5 Joules per cm². The iLuminage Touch can pulse 9 Joules per cm², of which 4 are with the flash of light and 5 are from the Radio Frequency. 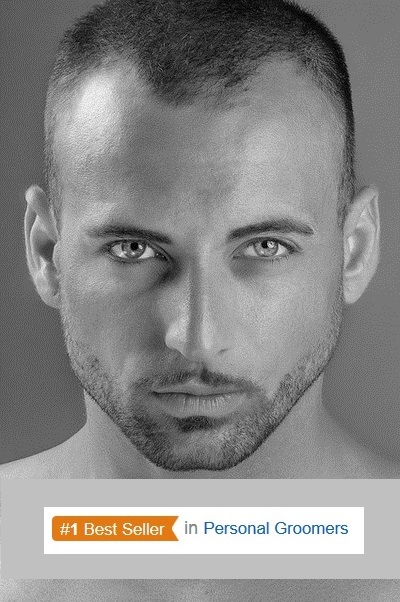 As you can see the TRIA can pulse higher Joules per cm² energy – This is important to effective zapping of the hairs. More energy – more heat – better epilating hairs. 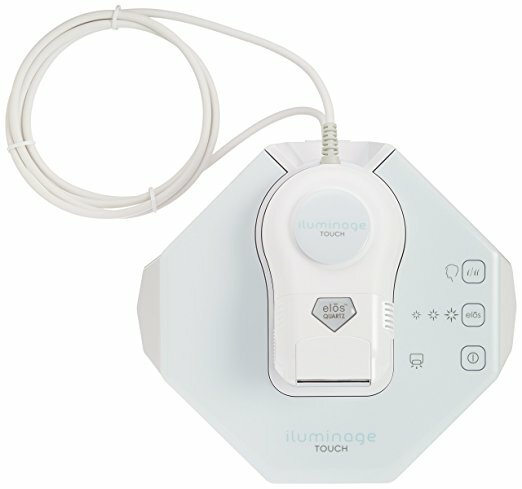 Both the TRIA and the iLuminage Touch have FDA clearance! They were both found safe and effective by FDA reducing hairs permanently. But because the TRIA uses laser, it has more limitation who can use it safely. As explained above the laser targets and heats dark matter. If the laser light is projected at dark skin, it will zap and burn the skin! If your skin is dark, dark brown or black, then the TRIA is not safe for you to use. The TRIA is approved for those who have white to mildly tanned skin, and those who have dark hair. 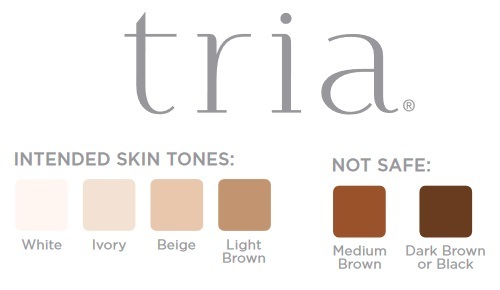 If you have white, ivory, beige or light brown skin than the TRIA will be a better solution for you. With more light energy per pulse, you will see better results for permanently reducing unwanted body hairs. You can click here and read Amazon customer reviews for the TRIA laser. The TRIA has a skin tone sensor at the bottom of the handle, you need to use it to unlock the TRIA before you begin to use it. The skin sensor checks to see that the skin is not to dark to treat with laser. You should use the skin tone sensor, on every body area you are treating to make sure you won’t cause any unwanted side effect. 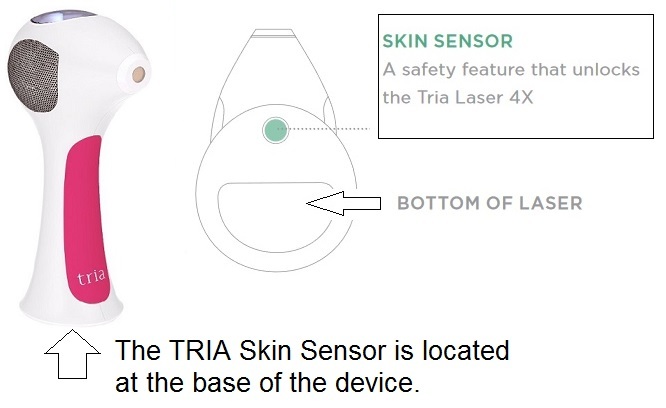 The tip of the TRIA has the skin-touch sensor which makes sure the tip is pressed before it emits laser. This is to prevent accidental pulsing of laser toward the eyes. The iLuminage is unique, because it has an FDA approval to be used on ANY SKIN COLOR! This is a huge benefit for those with darker skin tones, they can not use laser and they can not use IPL. The reason they can use ELOS is because the ELOS pulses low energy light up to 4 Joules per cm² (which is rather low and can not cause damage even to dark skin). The Radio Frequency bars add up to 5 Joules per cm² more, but the Radio Frequency is ‘color blind’ and is not light energy so there is no risk to zap the dark skin. The ELOS will pulse light only if the two RF bars are touching the skin, this is the equivalent to the TRIA skin touch sensor. Though IPL is less dangerous than laser, you would not want a pulse of light to reach your eyes. Having the bars contact the skin, makes sure no accidental pulsing of IPL into blank air can be done. Though for most people the TRIA has only upsides, there are some downsides worth mentioning. How Well Do You Stand Pain? First of all TRIA zapping is more painful than the iLuminage pulsing. As stated above the TRIA at the highest level pulses up to 22 Joules per cm² and the iLuminage is 4 Joules per cm². This means the TRIA treatment includes hundreds of zapping when treating legs, arms, abdominal, underarms etc.. It is not that the pain is impossible to stand, thousands of men and women use the TRIA, and managed the discomfort. 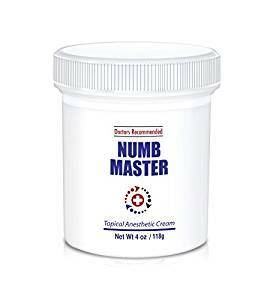 Most of them use topical anesthetic creams to numb the skin before the treatment. The iLuminage has an advantage here, because the IPL pulses are milder and not painful. Another downside of the TRIA compared to the iLuminage is that it is more time consuming. The TRIA laser tip is much smaller than the iLuminage Touch IPL window, so covering the same area of skin, will take 10 times more with TRIA than with iLuminage. It’s not like you do these treatments everyday but you will have to repeat therm 4-6 times a few weeks apart. 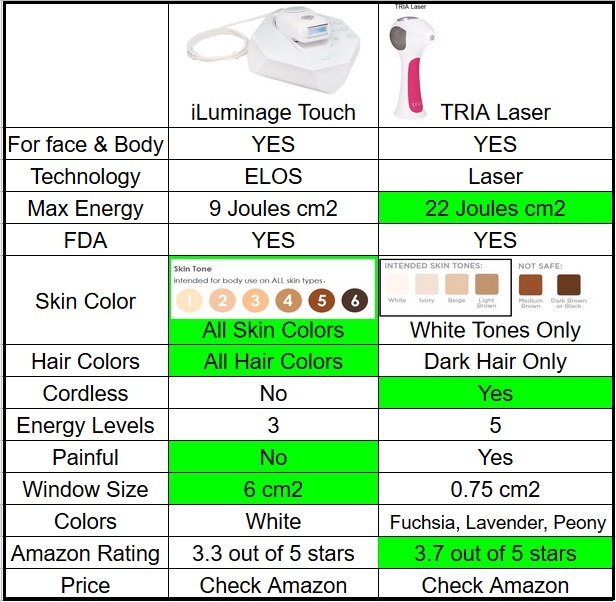 See the comparison diagram below between the TRIA and the iLuminage Touch covering treated skin. 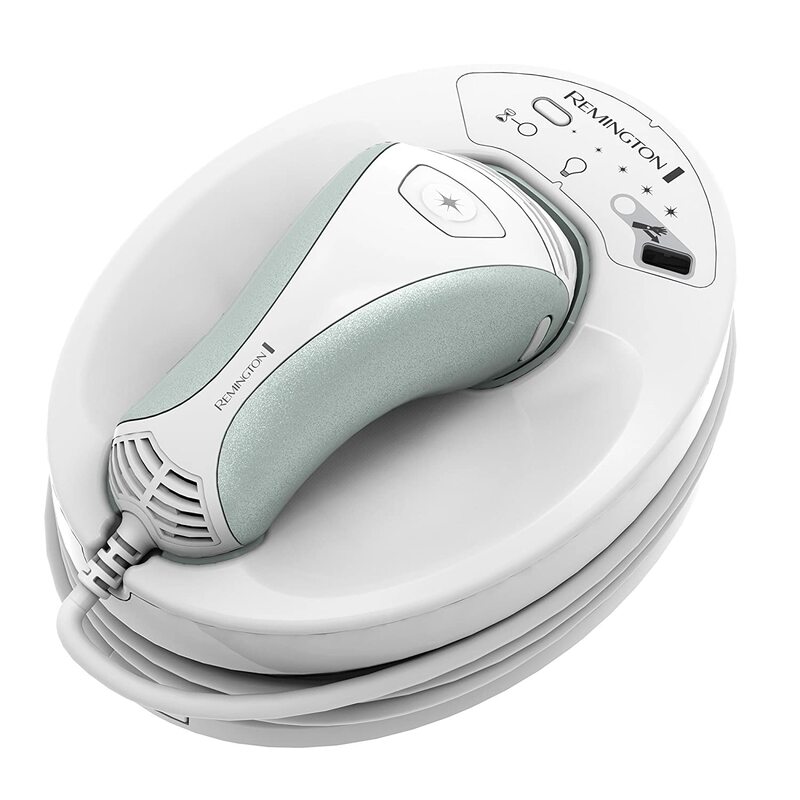 The TRIA is a cordless hair removal system, so you can use it anywhere you want, which is very convenient. The downside is that it needs to be charges approx every 30 minutes of treatment. The iLuminage needs AC power, so you need to have an electricity source to use it. The upside is that it can be used contentiously until you complete your whole body. Like every other item at Amazon the price of each device is changing depending on seasonal discounts and coupons issued from time to time. They usually have the similar price of $450. If you have a fair or white skin, than the TRIA would be better for you, with more energy pulsed you may find it more effective. 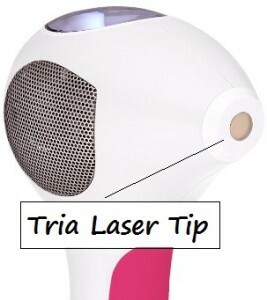 Click button below to see latest reviews and ratings for the TRIA laser. Click to shop at TRIA at Amazon or read current reviews. 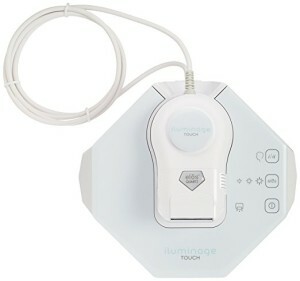 If you have dark skin, or red or blond hair, then the iLuminage Touch will be safer for your needs. In fact it would be the only device which you could use safely. If you live a fast pace life, and do not have time for long skin treatments, then the iLuminage is also your preferred choice, with a larger window it completes each treatment faster and smoother with less pain than the TRIA. Good luck getting rid of your unwanted hair!! 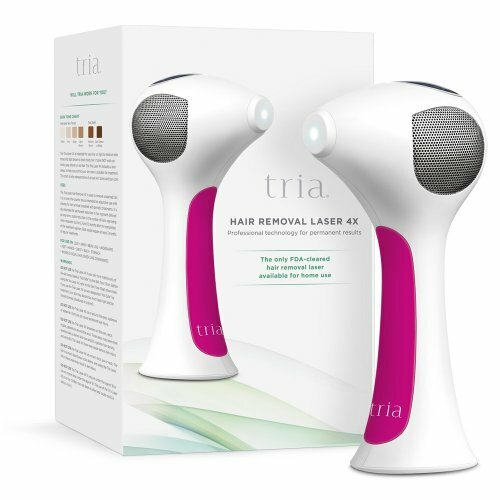 This entry was posted in Hair Removal News, Home Removal Systems, Laser Hair Removal Risks, Me my Elos Hair Removal, Tria Laser and tagged Does Tria laser work, iluminage Touch Permanent Hair Reduction Device, New TRIA 4X Laser by . Bookmark the permalink.